With Plenty, her new exhibition, Kim Osgood presents a new selection of her brilliantly colorful and exuberant monotypes. Her lively compositions incorporate birds, plants, flowers, fruit, books, and a variety of landscape settings. Her inspiration can come from memories, photographs, or the flora and fauna that populate the Northwest landscape. These visual diaries are begun intuitively by laying out a composition with oil-based printing inks, from which she then creates monotypes; a process using an offset press to make one-of-a-kind works on paper. This spontaneous and ephemeral technique suits Osgood artistically; her personal expression is interpreted directly into a distinct vocabulary of bold imagery and vibrant color. By using different ink consistencies in her compositions, she enhances the richly built up surfaces of the completed monotype. The irresistible vivacity that runs throughout her work reflects the energy and enthusiasm of the artist herself. Kim Osgood studied at Skidmore College in Saratoga Springs, NY and the Rhode Island School of Design. 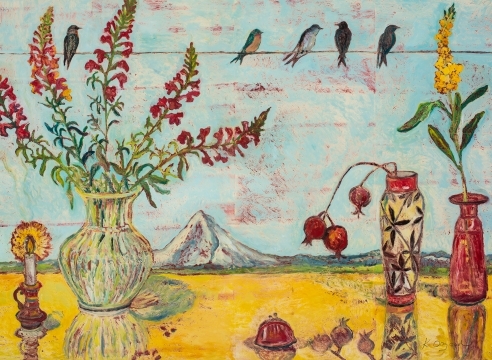 She has exhibited her work since the mid-1980s beginning with the Portland Center for the Visual Arts and including the Oregon Biennial, Portland Art Museum; PICA; Washington State University, Pullman; and Coos Art Museum, Coos Bay, OR. Her work is well collected and is part of many collections including the Bill and Melinda Gates Foundation, Seattle, WA; Nordtrom Inc, in multiple states; Legacy Emanuel Hospital, Portland, OR; Meyer Memorial Trust, Portland, OR; MOMO International, New York; Oregon History Center, Portland; and The Vivian and Gordon Gilkey Center for Graphic Arts, Portland Art Museum, OR.